WHAT YOU WON’T LEARN AT LJIC? 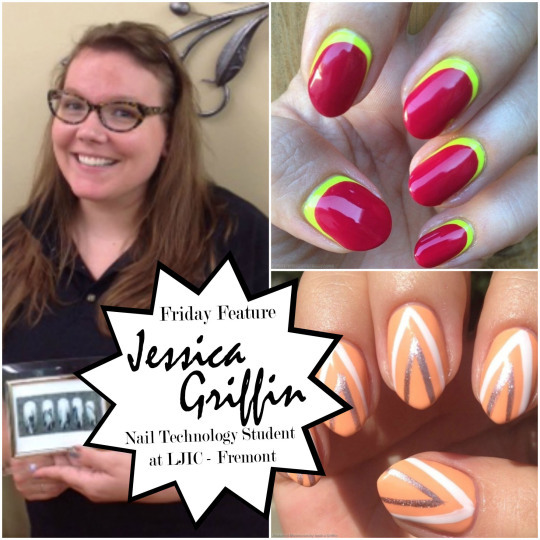 Nail technology has made great progress in the last 2-3decades, just ask La’ James International College nail technology student,Jessica Griffin. Jessica has always liked stylish nails. As a little girl she’d go with her mom to buy Lee Press On Nails at the local Walgreens. If you don’t remember the old commercials, Lee Press On Nails were “inexpensive,” unnatural, fake fingernails held on by a little more than double-sided tape. Her mom would get her the bright red or “classic French” and it kept Jessica entertained for hours. You won’t learn about Lee Press On Nails at La’ James International College, that’s a promise. You will learn the proper techniques for applying and removing more elegant acrylic nails and gel enhancements and Jessica says she’s grateful for that training. Prior to enrollment at LJIC, Jessica swore she’d never get either of the artificial extensions. She’d often hear her friends complain about the pain they endured during the removal process. Jessica is a former flight attendant and lives in Omaha with her two small daughters. She attends the LJIC campus in Fremont, Nebraska and says she actually enjoys the one hour commute to school. She chose LJIC when a friend said good things about them, now she’s the one saying she’d recommend La’ James International College. Jessica graduates in December and has dreams of one day owning her own business. She certainly has the talent as she recently proved by placing third at LJIC’s Trend Vision in the Runway Wearable Nail Art category. “Keep an open mind. Stay positive and embrace challenges with open arms” Jessica Griffin’s advice for students who are considering a career in the beauty industry. Is your future awesome? It can be. Call LJIC at 888.880.2108 today!